It’s called the Laikipia Plateau. It sits along the equator in central Kenya, in the shadow of snow-capped Mount Kenya. Laikipia’s vast grasslands, riverbanks, and watering holes attract a rich array of wildlife, including some of Kenya’s largest numbers of rhinos, elephants, leopards, and buffalo. 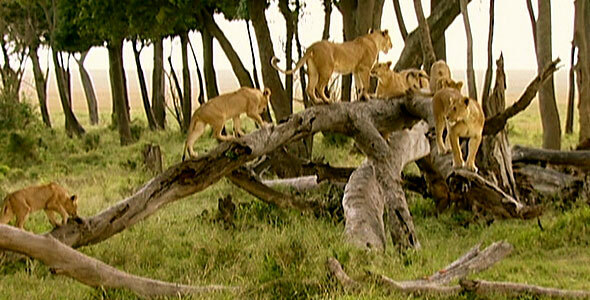 Researchers say the area — about 2 million acres — also supports nearly 200 African lions. Laikipia is also home to people, including Maasai herders, who often come into conflict with lions that have learned to prey on easy-to-catch cows. The end result, too often, is dead cattle and dead lions. In hopes of protecting both lions and farmers, local communities have embarked on a model experiment in wildlife-friendly land management called the Laikipia Predator Project, sponsored by the Wildlife Conservation Society and an array of other conservation groups. One of its main goals is to help local farmers protect their livestock from lions so they don’t have to kill them. The science of predator management is in its infancy, the pair says, “and every livestock producer has their own opinions on which practices best protect stock.” So one aim of the project has been to test which approaches work best. So far, the tests show that the best solutions employ basic common sense and are not very expensive, project leaders explain. For instance, the studies have found that the design and construction of “bomas” — traditional corrals for sleeping livestock — are key to protecting livestock from lions. “The stronger the better,” project officials advise, adding that bomas built from thorny acacia bushes work better than those made from solid posts or stone. The researchers also discovered that the height of boma walls was much less important than their thickness. “Thick walls were especially effective at preventing lion attacks, presumably because they prevented cattle from breaking out,” the researchers concluded. The Laikipia researchers are now testing the idea that lions are less likely to attack livestock where there is plenty of wild prey nearby. In The Vanishing Lions, for instance, viewers follow scientists with the Wildlife Conservation Society as they track lions that are wearing radio collars. The collars are used to study the cats’ hunting patterns and to try to understand why some prides develop a taste for livestock while others do not. Ultimately, project officials hope that the “predator-friendly management that we develop as a community in Laikipia will be a model for better conservation in the rest of Africa.” So far, the results are promising, as the Laikipia plateau continues to be one of the few places in Kenya where predator populations are growing, not dwindling.